See Driving Directions > Northern Sierra for context and how to get here. view GPS waypoints: simple Waypoint+ format, download GPX file, or overlay on interactive map. 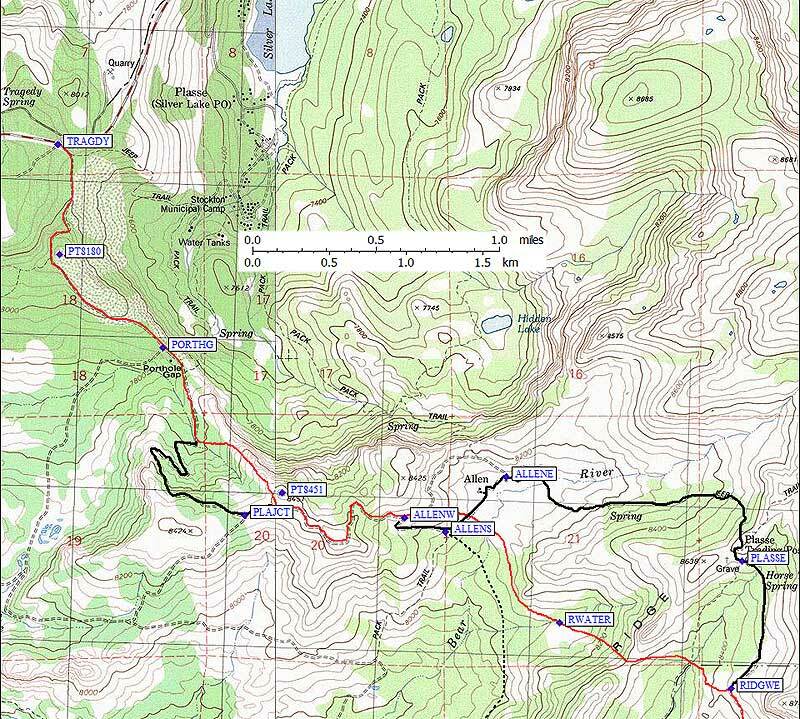 This file points you to roads which CROSS the range south of Lake Tahoe, but does not contain details of trailheads or roads that PARALLEL the range. The Climber.Org Driving Directions page can point you to other passes in addition to Northern Sierra trailheads, Highway 395 waypoints on the east side of the Sierra Nevada, and Central Valley waypoints on the west side. This file is intended for winter users. Summer trailheads may be elsewhere or marked differently! Scroll down for an overview map of Hwy 50 and Hwy 88 between the Central Valley and Nevada. Scroll down for notes about Sno Park permits. Scroll down for Echo Summit and Echo Lake Sno Parks, near Echo Summit on Hwy 50. Scroll down for Iron Mountain Sno Park, west of Silver Lake on Hwy 88. Scroll down for Silver Lake trailheads (Tragedy Springs and Kit Carson Resort). Scroll down for Carson Pass and Meiss Meadow Sno Parks, near Carson Pass on Hwy 88. There is a GPS route just for bypassing Sacramento, and three GPS routes that go through Hope Valley (where there are more trailheads) and ending south of Minden on Hwy 395 (in Nevada). From there you can follow Highway 395 south to many more trailheads. On Hwy 50, Silver Fork / Kyburz is 30 miles east of Placerville and 19 miles west of Echo Summit. The gas station there (waypoint SILVFK) sells permits when it's open. On Hwy 50 and Hwy 89, 5 miles east of Echo Summit in and a few miles south of the Lake Tahoe Airport in Meyers there are several stores that sell permits. The Chevron station (waypoint MEYERS) is a good example, but it's NO LONGER open all night even though it's open early in the morning. On Hwy 50, permits used to be available at the Echo Summit sno park (waypoint ECHSUM, leave Hwy 50 at waypoint ESTURN) but that parking area is no longer a full Sno Park and permits are not available there. On Hwy 88, permits are available just east of Pioneer at the Amador Station (209-295-4444, waypoint AMADOR, on the north side of the highway) and at Kay's Silver Lake Resort (209-258-8598, waypoint KAYRES, on the south side of the highway just west of the Silver Lake dam). Grant Line road leaves Hwy 99 (waypoint 99JGLR) about 15 miles south of Hwy 50. Follow it northeast across Hwy 16 (waypoint GLRJ16) to an intersection with White Rock Road (waypoint GLRWHI). Follow White Rock through a right angle turn and then go north to Hwy 50 on either Prarie City Road (waypoint WHIPRC) or Scott Road (waypoint WHISCT). Scott Road intersects Hwy 50 (waypoint 50JSCT) about 22 miles east of Hwy 99. These uncongested country roads can be a great alternative to the beaurocratic bungle of Sacramento. People sometimes get confused because the 80/50 split (waypoint 080050) comes up so fast and the signs may not give you time to change into the exit lanes. Hwy 50 (called I-80 Business, which used to fool my old StreetPilot GPS) seems to go straight with most of the lanes while regular old Hwy 80 (to Reno) is a right exit when you're heading east. The maps below shows only the portion of Hwy 50 from Kyburz to Echo Summit, where the trailheads are. See the overview map for the east and west ends of Hwy 50. Wrights Lake Road is paved. It's not plowed in the winter, but it's not gated either. The turnoff to Wrights Lake is west of Strawberry, and while it may not be obvious it's the only one just a few miles east of Kyburz. There are many cabins near Wrights Lake, Dark Lake, and others, and in winter the owners drive up this road to where they can unload snowmobiles. That means hikers will encounter lots of motorized traffic until they get off the main road to Wrights Lake, but it's easy access to the west side of commonly climbed Pyramid along with uncommonly climbed McConnell, Price, Red, and others. See this 2012 trip report for details in winter. Park on any pullout along the road, from a few yards to a few miles from Hwy 50 (depending on snowpack and your vehicle). Tim Hult adds: Some of the pavement on the road has large pot holes that come up unexpectedly so one shouldn't drive pell mell without some caution. Most of the bridges appear to be new and the road is well graded. The turn outs and parking for the various trailheads are well marked as well. As far as parking directions at Wright Lake, it's pretty straight forward. The road terminates at Wright Lake with branches to either trail head. The camp ground is pretty nice, but I didn't stay there. The parking is to the left and is clearly marked as being past the summer "visitor center" (a small one room cabin that appears to be manned during the high season). This paved "hikers parking" can accommodate in excess of 50 cars, with an overflow lot that is before the visitors center cabin accommodating another 10 - 20. This overflow lot is also clearly marked as just that "hiker overflow lot." There is a standard forest service pit toilet at the end of the parking lot as well as a trash receptacle. The Echo Summit Sno Park (waypoint ECHSUM, leave Hwy 50 at waypoint ESTURN) is apparently no longer managed by the state, but it's still there. It's more for families and snowplay, no overnight parking. The Echo Lake Sno Park (waypoint ECHLAK, leave Hwy 50 at waypoint ELTURN) is far quieter if you plan to spend the night. This is where skiers and snowshoers head across the frozen Echo Lake toward Pyramid, Ralston, etc. The Sheriff confirmed in 2004 that it's OK to sleep on the ground by your car, but be prepared for them to ask you what you're doing - they're used to motorhomes, not bivy bags. No tents in the parking area. East of Echo Summit is Luther Pass, Hope Valley (with several great winter trailheads), and Woodfords where you head down to Hwy 395. Hwy 89 goes up the west shore of Lake Tahoe, Hwy 50 goes up the east shore. They are briefly the same road (through Meyers), which can cause some confusion! See the Northern Sierra Trailheads page for lots of west shore trailheads. The east shore (in Nevada) doesn't have much in the way of climbing trailheads. The two main GPS routes start and end with the same set of waypoints but one leads you just north of Jackson (which can save time if there is a festival or other congestion, but which bypasses almost all the services in the area). The best connection between Hwy 5 and Hwy 9 (to reach Hwy 88) is by Hwy 4. The signs are pretty clear, and the connector is all freeway. Don't miss the left turn at waypoint 088012! The Iron Mountain Sno Park (waypoint IRONSP) is not near any peaks. But it's a quiet place to spend the night compared to Carson Pass. See maps above. There are no signs regulating parking at a plowed parking lot (waypoint KITCAR) just off Hwy 88 at the signed turnoff for Kit Carson Resort. Sno-Park permits are apparently not required. GPS route KIT CARSON goes to Thimble by way of Thunder. It is intended for winter use, when trails are buried and cross-country travel is easy. Thunder has a great snow chute with interesting volcanic rock going straight up from waypoint THUCOL, but the top is easy 2nd class. Thimble has a class 4-5 summit flake of volcanic aggregate, and is right on the Kirkwood ski area boundary. When traversing between these peaks, be sure to respect the ski area boundary. See Steve's trip report for winter climbing details. There are plowed areas on both sides of the highway at waypoint TRAGDY. It appears that locals park on the south side (to access their private property) and visitors park on the north side. Be careful not to block in vehicles that may be buried under plowed snow, and watch the forecast so you don't get plowed in. There are no signs regulating parking here. Sno-Park permits are apparently not required. (This might be part of a series of snowmobile trailheads maintained by a local club, and connecting to the Iron Mountain Sno Park, so be nice to other users you meet in the backcountry.) Those snowmobiles may help you by packing a trail, or they may annoy you by buzzing by while you trudge along. Your choice! GPS route TRAGEDY SPRINGS goes all the way to Mokelumne, which is not on the map below. It is intended for winter use, when trails are buried and cross-country travel is easy. The black lines represent avoidable roads which are probably heavily used by snowmobiles. The red line is optimal for skiers/snowshoers. In winter, there was still running water at waypoint RWATER (and apparently nowhere else close to the peak). See Steve's trip report for winter climbing details. The Carson Pass Sno Park (waypoint CARSON, map below) is immediately west of the pass on the south side of Hwy 88. It's noisy and busy all day and all night, mostly with truckers and sightseers. If you walk a bit into the trees you can spend the night but you'll hear jake breaks and cars stopping. This lot seems to be the usual meeting spot for day trips to Round Top, The Sisters, Elephant Back, etc. GPS route ROUND TOP CARSON goes to Sisters (waypoints SISTRE and SISTRW) by way of Elephants Back (waypoint ELEBAK) and Round Top (waypoint RNDTOP). It is intended for winter use, when trails are buried and cross-country travel is easy. 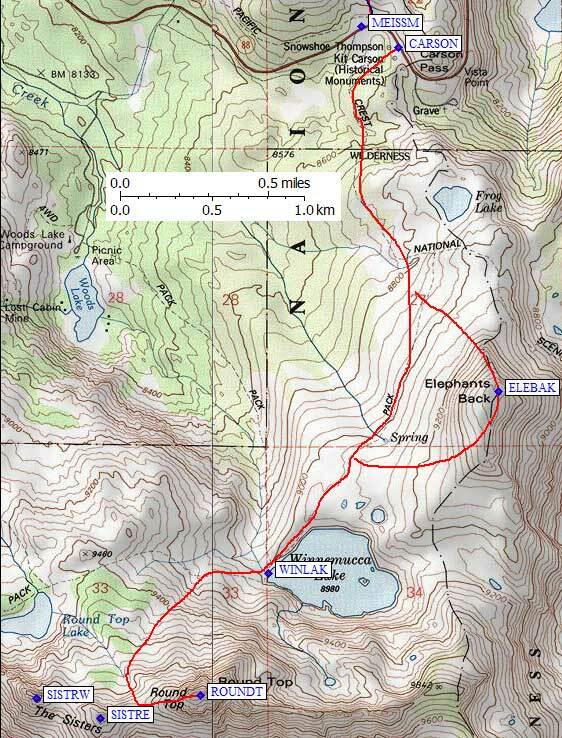 Elephant is trivial, I haven't done Sisters, and Round Top is easiest from the saddle (RNDSAD) just west of the summit. Between the saddle and the summit you must sometimes ascend an icy or snowpacked steep slope, walk along a rocky ridge, drop to a notch, and climb the high point to the east. A direct ridge run is 3rd class, and can be dangerous with ice and/or snow on it. You can turn the notch on the south to keep the climb 2nd class, but in some snow conditions you'll feel exposed here. The Meiss Meadow Sno Park (waypoint MEISSM, map to the right) is about a tenth of a mile west from the Carson Pass lot, on the north side of the highway. It has less in and out traffic and seems to be more used by backcountry people. When the snow is deep, a burm between this lot and the highway cuts down some of the noise. Use this trailhead for Red Lake Peak and Stevens Peak. GPS route STEVENS PK CARSON goes to Stevens Peak (waypoint STEVSP) by way of Red Lake Peak (waypoint REDLKN). Both peaks have highpoints nearby that are NOT the location shown as the summit on the USGS maps (waypoints STEVNH and REDLKP). See Steve's trip report for winter climbing details. Return to index of trailhead Driving Directions.